As everyone knows that in the battle of Mahabharat, Arjun refuses to fight and giving up his weapon, shedding tears from his eyes sits in the rear part of the chariot parked in the midst of the two enemies in the battlefield. Then the Kaal-power (Brahm) penetrated in God Krishna advises Arjun to fight. Then Arjun says that, God, I will not do this wrong act. Instead of this, it is better for us to survive by eating begged food. Then God Kaal penetrating Shri Krishna’s body says that, Arjun, fight. You will not incur any sin. See in Gita Ji Adhyay 11 Shlok 33, Adhyay 2 Shlok 37, 38. There is a piece of writing (topic) in Mahabharat that on Krishna Ji’s persuasion, Arjun agreed to fight. A fierce battle occurred. Crores of people and all Kauravs were killed in the battle and Pandavs were victorious. When God Krishna himself asked the leader of Pandavs, Yudhishthir, to sit on the royal throne, Yudhishthir refused to sit, saying that I will not rule such a sinful kingdom in which crores of men were killed. Their wives became widows, crores of children became orphan; even their tears have not dried yet. Seeing things not working out in any way, Shri Krishna Ji suggested that you may take advice from Bheeshm Ji. Because when a person is unable to make a decision himself, then he should discuss with a family member. Yudhishthir agreed to this. Then Shri Krishna Ji along with Yudhishthir arrived where Shri Bheeshm was counting his last breaths on a bed of arrows. On reaching there Shri Krishna Ji said to Bheeshm that Yudhishthir is refusing to sit on the royal throne. Please instruct him on politics. Bheeshm Ji counselled a lot, but Yudhishthir did not deviate from his decision. Just kept on saying that, by enjoying this sinful and bloodstained kingdom, I do not want to go to hell. Then Shri Krishna Ji said that, you do a Dharm Yagya (religious yagya). Because of which you will not incur the sin of the killings done in the battle. 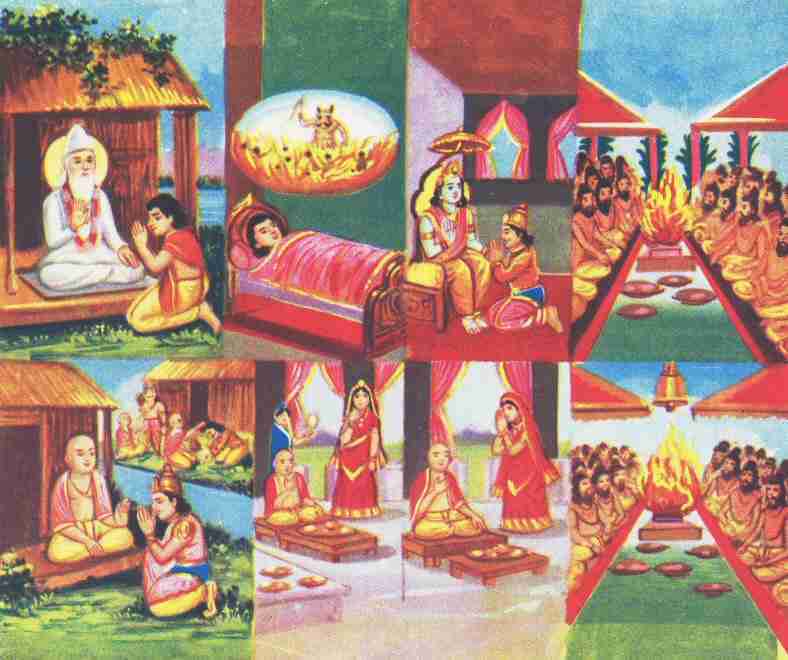 On this Yudhishthir agreed and performed a Dharm yagya. Then, he sat on the royal throne. He became the king of Hastinapur (Delhi). A few years later, Yudhishthir started getting nightmares. As if many women crying and sobbing are breaking their bangles and their innocent children, standing beside their mothers and some sitting, are crying while saying, father-father; as if, are saying, oh King! Get us killed too, send us to our father. Many a times, sees headless trunks. Someone’s head is lying somewhere, trunk is lying somewhere else; there is an uproar everywhere. Yudhishthir’s sleep gets disturbed, sits up in the bed confused and gasping. Spends the whole night sitting and roaming in the palace. One day, Draupadi saw this state of the eldest husband. On asking the reason of distress, Yudhishthir avoided it by saying, its is nothing. When Draupadi saw this miserable state of Yudhishthir on many nights, then one day, she disclosed it to all the four (Arjun, Bheem, Nakul and Sahdev) that, your big brother is very distressed. Ask him the reason. Then the four brothers came to their big brother and requested, please tell us the reason for your distress. On much insistence, Yudhishthir narrated his whole story. The five brothers, to know the reason for this distress, went to God Shri Krishna Ji and explained to him that big brother is getting such nightmares. Because of which his night’s sleep, peace of day and appetite has ended. Please tell us the reason and the solution. Having heard everything Shri Krishna Ji said the sins committed in the battle are causing distress. These sins are removed by performing a yagya. Hindi translation of Gita Ji Adhyay 3 Shlok 13: - The superior men, who after offering the food to the deity (Purna Parmatma) situated in the yagya, eat the remnants, they become liberated from all the sins. The sinful people, who only cook food to sustain their bodies, eat the sin only i.e. by doing a yagya, become liberated from all the sins. Seeing no other way out, the Pandavs accepted Shri Krishna’s advice. The preparations for yagya were done. Shri Krishna Ji suggested to invite all the men of the Earth, Sages, Siddhs, Sadhus, and even the demigods of heaven. He said that more the number of people who will have food, more will be the merits. But special benefit is from saints and sadhus; of these also, there might be a saint endowed with supreme power, he can give full benefit and placed the evidence of completion of yagya, a five-faced (Panchjanya) conch shell on a high, decorated stage, and said, when a saint with great earnings (possessing supreme power) will have food in this yagya, then this conch shell will itself make a sound. It will be so resonant that will be heard on the whole Earth and upto Heaven. Preparations were done for the yagya. On the fixed day, all the respected invited devout persons, 88 thousand Rishis, 33 crore demi-gods, nine Naaths, 84 Siddhs, Brahma, Vishnu, and Shiv etc arrived. The act of yagya started. Then later, everyone fed the remnant food (prasaad-bhandara) of the yagya to all great men and devotees and the ordinary people present there. Even God Shri Krishna Ji himself had food. But the conch shell did not blow. Because the conch shell did not blow, therefore, the yagya was not completed. At that time, Yudhishthir asked Shri Krishna Ji, Oh madhusudan! The conch shell did not blow. All the great men and entrants have had foood. What is the reason? Shri Krishna said that there is no Purna Purush (a worshipper of Satmnaam and Saarnaam) in these. Then Yudhishthir was astonished that so many great mandleshwars, among whom are Vashisht Muni, Markande, lomash Rishi, nine naaths (like, Gorakhnaath), 84 Siddhs etc-etc and God Shri Krishna himself have eaten, but the conch shell did not blow. On this Krishna Ji said, all these are hungry of praise and seniority. There is no one who wants God and by doing sadhna according to their whimsical desires and showing siddhis (supernatural powers), these attract the world. Innocent people applaud them and flutter around them. These will themselves go to births of animals and will also take their followers to hell. Then God Krishna by his power showed the future births of all those Mandleshwars to Yudhishthir, in which someone had acquired the form of an earthworm, and someone of sheep-goat, buffalo and lion etc. On seeing all this Yudhishthir said, “Oh Lord! It means the Earth has become devoid of a saint.” God Krishna replied, “When the Earth will become devoid of a saint, it will catch fire. All the living beings will die fighting with each other. This equilibrium is maintained by the power of a Purna Sant (Complete Saint). Then I (God Vishnu) on coming to Earth finish all the people with demoniac nature so that the saints can be at ease. Just as a farmer cuts all the weeds which may harm his crop and throws them out. And then that crop flourishes independently; which means that these saints provide the joy of irrigation in that crop. A Complete Saint grants equal happiness to everyone just as water nourishes both the types of plants. They are compassionate towards every living being. Now I will show you a Complete Saint. A Mahatma lives in the north-eastern/northeast part of Delhi. We have to send for him. Then Yudhishthir said, “The responsibility of inviting saints in that direction was entrusted to Bheemsen. Let us him whether he had gone to that Mahatma or not.” When on calling Bheemsen asked him, he told, “I had met him. His name is Swapach Sudarshan. He belongs to the Balmiki race and is a householder saint. He lives in a hut. He refused to come to the yagya. On this Shri Krishna Ji said, “Saints do not refuse. Tell us all the conversation you had with him.” then Bheemsen further revealed, “Inviting him, I said, “Oh Sant Parwar (Supreme Saint)! Please do us the favour of coming to our yagya. I explained him everything. Instantly, he (Sudarshan Saint Ji) started saying, “Bheemsen, the saints will incur sin by eating your sinful food. You have done a lot of damage. By killing crores of beings, you are enjoying the kingdom today. The widow women and orphan children of the soldiers, who have died in the battle, cry for hours remembering their husbands and fathers time and again. Then the children embracing their mothers are asking, “Mother, papa has not come on leave. When will he come? He will bring new clothes for us. The second girl says, “He will bring a new sari for me. When I will get married on growing up, I will go to my in-laws’ house wearing it. That boy (who is ten years old) says, “This time I will say to papa that you do not go to the service. My mother and brother-sister suffer a lot without you. Whenever you see, mother is crying remembering you day and night in a secluded place. Either call us all to you or live with us. Leave the job. I have become a youth. In your place I will go in the army and serve the country. You live with your family. Let father come, I will not let him go. (To save them from being distressed, their mother did not tell them that, your father has died in the battle because at that time those children had gone to their maternal uncle’s house. Only the youngest child, who was a year and a half old, was at home. The other children were intentionally not called.) Thus, distressed by the mutual conversation of those innocent children, their mother’s heart filled with grief of her husband’s memory. To relieve it (to cry) went into another room and burst into tears. Then all the children falling on their mother started crying. The relatives came and consoled them. Then said that tell clearly to the children that your father has died in the battle. When the children came to know that now our papa (father) will never return, they started cursing that selfish king, who for the division of land between brothers, drank the blood of the sons of the world. It was not even a fight for the defence of the country in which we would have contented ourselves that they have given their lives for the welfare of the country. This bloody king for his own luxuries has caused bloodshed. Now he is enjoying a lot.” Saint Sudarshan (Swapach) is telling ahead that, Bheem, crores of such beings are suffering from the pain inflicted by the battle. Their suffering will not let you be in peace even if perform crores of yagyas. Who will eat such an evil food? If you want to call me then vow to give me the merits of the hundred yagyas you have performed earlier i.e. give me the fruits of one hundred yagyas, then I will have food at your place. On hearing this from Sudarshan Ji’s mouth, Bheem told that I said, “You are a strange man. You are asking for the fruits of one hundred yagyas. This is our second yagya. How shall we give you the fruits of hundred? It is better that you do not come. Anyhow, it is not that the yagya will not get completed without you. On hearing the whole conversation, Shri Krishna said, “Bheem, one should not misbehave with saints. One can find the end of seven seas, but cannot find the end of a saint of the Satguru (Kabir Sahib). Even the three loks are not equivalent to one hair of that Mahatma Sudarshan (Swapach). Come with me to bring that dear hans (evilless soul) of the Supreme Father God. Today, the five Pandavs are kings and I, Dwarkadheesh, despite being a king, have myself come here barefoot. There is no sign of arrogance at all, and Bheem also stood up and asked for forgiveness for the offensive words said by him the other day by falling at Sudarshan’s feet. Therefore, Oh Naath! Today accepting the fruit of the yagya equivalent to the steps of your six servants who have come to you to obtain your sight, please accept hundred and grant the remainder to us beggars so that we may also be blessed. Seeing such submissiveness in all the present men, Jagatguru Sahib in form of Sudarshan (Karunamay) became very pleased. Swapach Sudarshan Ji ate the whole food by making five morsels of it. The conch shell sounded five times. After that the conch shell did not make any sound. At that time, Shri Krishna Ji thought that why did the conch shell not blow even after this Mahatma Sudarshan has had food? Then he saw with his divine vision. Then he said to Draupadi, “Draupadi, every being sleeps after having plain food in his house. You have developed conceit in your mind by preparing good food. A religious rite (yagya, hawan, paath) performed without respectful treatment is not successful. And what do you think of this simple man? He is Supreme God. Even the three loks are not equivqlent to his one hair. You have thought ill about this Greatman in your mind because of which your mind/inner-self has become polluted/dirty. By his consumption of food, this conch shell would have made a sound upto heaven and the entire brahmand would have resounded. Now this has only sounded five times so that your misconception is cleared because by consumption of food by any other sage, it did not even budge. Now cleaning/clearing your mind and considering Him to be God, you may wash His feet and drink that water, so that the dirt (sin) of your heart is removed. At that very moment, accepting her fault Draupadi asked for forgiveness from the saint and washing Swapach Sudarshan’s (a householder) feet with her own hands made charnamrit (foot-nectar). She started drinking the water filled with dirt. When she had drunk half of it, God Krishna Ji said, “Draupadi, give some nectar to me too so that I am also blessed.” Saying this Krishna Ji drank the rest of the foot-nectar. At that very moment, that five-faced conch shell blew so loudly that its sound went upto heaven. Then that yagya of the Pandavs became successful. In the dialogue during yagya, God Krishna himself says that Yudhishthir all these people who have assumed an appearance and all the sages, Siddhs, demi-gods, Brahmins etc are hypocrites. They do not have any devotion in them. By pretension they make themselves glorified in front of the innocent devotees. Now the readers should contemplate that, that time was Dwaparyug, and the saints of that time were very good sages because 5500 years ago even an ordinary man used to have noble thoughts. Thirty-forty years ago, the thoughts of an ordinary man used to be much better than today. If we compare this with that of 5500 years ago, then the Sanyasi-sadhus of that time were much superior to the contemporary saints-sadhus. Even then God himself said, “These are all animals, they are not worshippers of Satyanaam.” Garibdas Ji Maharaj has stated this same bitter truth in “Shatdarshan Ghamoda Bahda, in Bahde Ka Ang, in Tark Vedi, in Sukh Sagar Bodh, in Aadi-Puran”, that the sadhna which these worshippers are doing is bahda (unnecessary) without Satyanaam and Saarnaam.